Chart No. 60 - The Negative Reflexes of the Colon Found in the Legs Between the Tibia and the Fibula. Manipulative movements in the direction of the energy flow are soothing. Movements opposite to it are stimulating in effect. On the right leg anterior the energy flows toward the foot on the left leg anterior - away from the foot and upward. Fishes show energy flow anteriorly. The negative pole of the colon is in the legs as illustrated. Aching legs and knee joint pains especially along the outside of the shin bones are colonic reflexes of irritation, stagnation and gas pressure. They can cause headaches and heart symptoms. 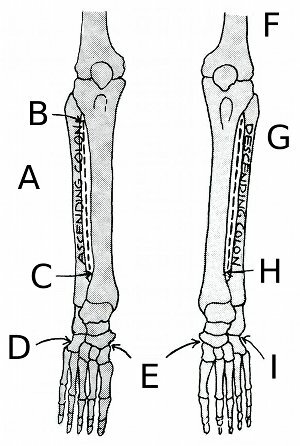 (G) Right thumb contacts moving up and down in space between the two bones. Contact 1. From the arch of the foot to the colon reflex area on the leg. Contact 2. From the outside of the foot to the colon reflex area between the tibula [tibia] and fibula, also straightening the foot by holding the contacts. Contact 3. 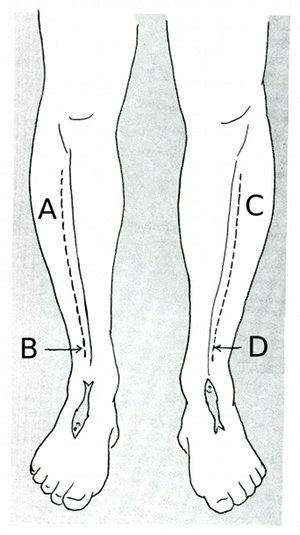 Contact on the same colon area on the leg may be held anywhere on the dotted line and another contact on the colon itself can be made to balance the neuter [neutral] pole above with the negative blocks below to eliminate them. The object is polarity of current flow not massaging. All contact should be made with the same attention as striking keys on the piano or typewriter.